SIGforum.com Main Page Reloading Looking for a new coated 9mm bullet, what’s your favorite? Im looking to try another brand of coated 9mm bullets. Partially just because I need some more and partly to see if any others are better. I’m using Summer Enterprise 145gr HiTeck RN and I like them but I have to seat a little deeper for my CZ and they seem kind of messy when loading. Not shaving in the seating but flakey. Anyway, since I’m low on bullets I want to try some others with a different shape and maybe try some 135gr. What is your favorite brand of coated lead bullets? Love the 147gr over VV N320. It's like shooting marshmallows. No recoil. I have recently bought SNS Casting bullets. They have been great so far. If you buy in quantity there is a discount after 5000 or 10,000. Give a positive review and get a 5% discount code. Where are these guys located? If that information is on their website it is well hidden. Or maybe I need to re-read "Internet for [Senior] Dummies." I vote for Blue Bullets. They use virgin lead alloy as they found too much variation in recycled lead alloy. I've never had an issue with their bullets. The Father/Son owners are good people. Nathan has a Law Enforcement and USPSA background. 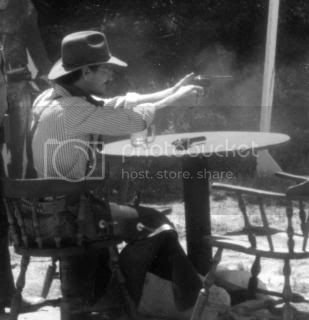 They support a lot of shooting competitions in the Southeast as well. I've run Black Bullets and Bayou in the past without issues as well. When I measured a bunch of Black Bullets vs. Blue Bullets I found less deviation with the Blue Bullets. The results are somewhere on the CZ website. For full disclosure, I don't live too far from Blue Bullets and I BS with them now and then. However, I wouldn't use their stuff if it wasn't quality. Summers has the best prices I've found, the bullets shoot well, and excellent customer service to boot. I've shot thousands of his cast and just recently picked up some coated, which are working out well. I just wish he made a 405gr .458 cast bullet for my .45-70. Acme bullets are my choice. Black Bullets is located in Alamo, TN. Left to right: Bayou 135gr RN, Summers 145gr RN, Bayou 147gr FP. The Bayou are slicker and shinier. I’ve shot about 1,000 of the Summers and they shoot well so I’m interested to compare to Bayou. I’m excited to maybe be able to load a tad longer with the lighter bullet and different shape for the CZ. I also want to try some other weight and profile of Summers. I've used both black bullets, and acme. Whichever is cheaper gets my business, be sure to consider shipping costs. One of them, I've forgotten which, includes shipping in their price. I make my own with a Saeco mold & coat them but if I buy, I prefer Bayou. Summers is good for the price, but if the coating flakes, it isn't cured properly. I looked at the Blue Bullets website. Saw 9mm 147 gr in both Round Nose and Flat Point, same price. Stand by for my dumb question: For general range use, do you recommend Round Nose or Flat Point? Why? My 9mm pistols are SIG P228, P239, and P938, if that makes a difference. I looked at the Blue Bullets website. 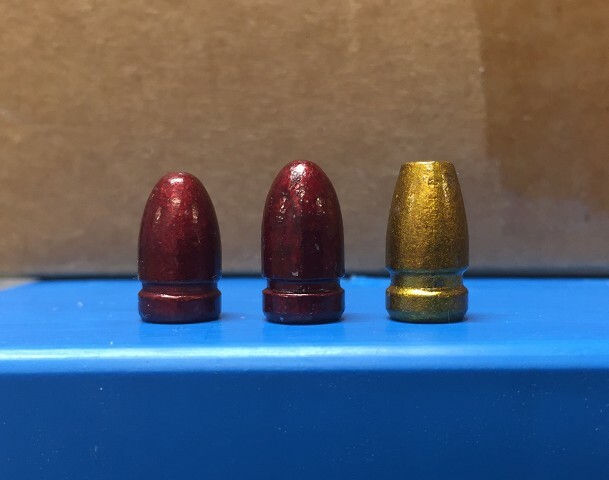 Saw 9mm 147 gr in both Round Nose and Flat Point, same price.Stand by for my dumb question: For general range use, do you recommend Round Nose or Flat Point? Why? My 9mm pistols are SIG P228, P239, and P938, if that makes a difference. RN works in just about anything. FP can be an issue in some guns. So when in doubt, go RN. Looking at the FP Bayou I have, and seeing some issues with others guns, I think I’ll Karma then off. The 135RN looks promising so I hope it shoots well. I second that. I'm currently using Acme bullets exclusively. I pretty much use Blues exclusively at this point, although I do like the Precision Blacks out of Texas. You will not beat the price of Blues if you are a high volume shooter and I really love their subscription option. I save 13% off list price and they ship me a case a month, like clockwork. Plus they do a lot to support the shooting sports.. I have no affiliation with the company aside from just really liking the product. Quick Reply to: Looking for a new coated 9mm bullet, what’s your favorite?